Portsmouth will not face a further points deduction if the club is still in administration when it starts next season in League One. Trevor Birch of administrators PKF said he had received the assurance from the Football League. Birch said the news represented "another step on the road to recovery". But he added: "The big test comes over the next few weeks when we have to reduce the player wage cost for next season to a level the club can afford." In February Portsmouth entered administration for the second time in three years, for which they were docked 10 points by the Football League to leave them in the Championship relegation zone. The Fratton Park side were then relegated to League One in April. A PKF report subsequently revealed the club was £58m in debt and that liquidation was a real possibility. Since then former Portsmouth owner Balram Chainrai, to whom the club owes around £19m, has made a firm offer to buy the club back through his company Portpin. 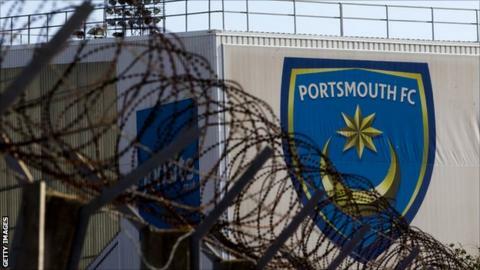 The Pompey Supporters' Trust has also indicated it is close to finalising an offer to rival Chainrai's bid. Birch added: "We are continuing to work with Portpin on the details of its bid to buy the club, which will form the basis of proposals for a CVA [Creditors' Voluntary Agreement] with creditors."